All-American Bethany Besancenez sets fellow All-American Nicole Mattson in the first round of the NCAA South Regional on Nov. 15 in West Palm Beach, Fla.
Twenty-two student athletes have taken home individual honors during their respective seasons over the course of the fall semester. While some seasons such as basketball and swimming are just beginning, a majority of the fall sports have concluded with in-season and post-season honors already being given out. Athletic director Pete Meyer was extremely proud of how Florida Southern athletes have performed on the field and in the classroom this semester. According to Meyer, student athletes graduate at a higher level than the general population which is something he says has been and will continue to be the expectation for the department. Last year, Florida Southern won the Mayors Cup for both men’s and women’s sports as the top academic program in the area. “The college has been fantastic in understanding that and the willingness to support us with the resources we need, and the Lakeland community is phenomenal in supporting our athletic endeavors,” Meyer said. The following is a complete list of all individual athletic and academic awards earned by FSC student athletes this fall. After a rough start to their season, the volleyball team quickly turned things around with a 4-0 run at the Terrace Hotel Classic while sweeping the SSC Weekly honors. Nicole Mattson was named Offensive Player of the Week, with setter Bethany Besancenez and freshman Tierra Porter also picking up SSC honors for setting and defense respectively. That same week, Mattson was named the Division II National Player of the Week after totaling 85 kills at the classic. For in-season awards, Mattson and Besancenez would each win another SSC Player of the Week over the course of the season. Sophomore Rachel Martin also picked up her own SSC Offensive Player of the Week award after Mocs victories over Nova Southeastern and Palm Beach Atlantic at the end of September. At the end of the regular season, Mattson and Martin were named to the All-SSC first and second teams. Mattson would win Player of the Year for the South Region and be named to the All-South first team with Martin named All-South second team. Academically, Besancenez and Mattson would both be named to the Academic All-District team. The America Volleyball Coaches Association (AVCA) would name Mattson (South Region Player of the Year), Besancenez, and Martin to its All-South region squad. On Nov. 27, Mattson, Besancenez, and Martin earned All-American honors from the AVCA. Mattson was named First Team All-American while Besancenez joined as a Third Team All-American. Martin was named as a Honorable Mention. 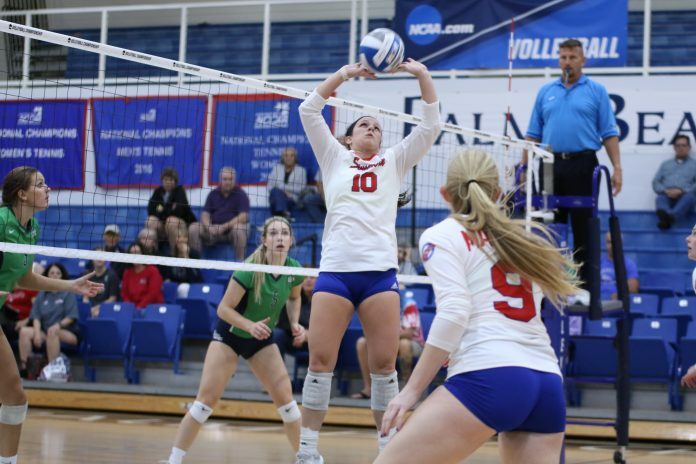 This year’s honors brings the total of AVCA All-Americans at Florida Southern to 51. With the team preparing for the NCAA National Championships on Dec. 1, the men’s cross-country team has been led by sophomore Mason Jones, who was named SSC Runner of the Week four times this fall. Jones won the Holloway Park Preseason Festival, finished fifth at the Queens City Invitational at McAlpine Creek Park, took home fourth place at the Walt Disney Cross Country Classic at the ESPN Wide World of Sports, and finished third overall at the USC Beaufort Sand Shark Invitational in Hardeeville, SC. In all four of those meets, Jones was the top runner among Division II participants. As a team, four Moccasins were All-SSC Selections with Jones, Josh Wagner, and Dean McGregor being named first team selections while Mitchell Kozik was named as a second team selection. Jones and Wagner were both named to the U.S. Track & Field and Cross-Country Coaches Association Division II Cross Country All-Region Team after finishing top-25 in the NCAA South Region Championship. Sophomore Addison Cantor was selected as SSC Runner of the Week on Oct. 8 after finishing fourth overall, and tops among Division II runners at the Walt Disney Cross Country Classic. Cantor and fellow sophomore, Hannah Flemming would both be named to the All-SSC first team and the All-Region team after finishing top-25 at the NCAA South Region Championship. The men’s soccer team set multiple school records this fall due in part to outstanding individual performances by some of their veteran players. In mid-September, James Meehan was named SSC Offensive Player of the Week and Benny Yusufoglu was named SSC Defensive Player of the Week for their contributions in a 2-1 overtime victory at Lynn. Christoph Gums was named SSC Offensive Player of the Week on Sept. 24 after scoring two goals with one assist over the course of two Mocs victories the week prior. Claus Lehland took home SSC Defensive Player of the Week in mid-October after playing lock down defense and creating multiple key turnovers that resulted in Moccasin goals. Defender Foster Appiah, Midfielder Gums, and Forward Meehan were all named to the second team for the United Soccer Coaches All-South Region Team. This is the first selections for the ream since 2011 and the most in one season since 1997. Goalie Tori Routt took home the lone SSC weekly honor for women’s soccer after being selected as the SSC Player of the Week. In just her fifth career start, Routt shut out Embry-Riddle in a 1-0 victory, her first as a Moc. In post-season honors, Gaelyn Crowder was named All-SSC second team with Caitlin Quempts being selected to the Google Cloud Academic All-District team. Still in the early parts of their season, two Mocs have already taken home SSC honors. Brett Hanson was named SSC Defensive Player of the Week on Nov. 12 after having nine steals and 13 rebounds in two games the week prior. Slinky Jones was also named SSC Defensive Player of the Week on Nov. 19 after having 14 rebounds, three blocks and two steals in a win over Southern New Hampshire. Matthew Holmes was named SSC Swimmer of the Week on two occasions this fall. His first award came at the end of October when he won three individual events at a meet in Tampa while anchoring multiple relay teams. Holmes’ second award, which came the week after his first one, came at a meet at Florida State where he finished, first, second, and third in his three individual competitions. Amanda Gartrell was selected as SSC Golfer of the Week back on Oct. 22 after a second-place finish at the Saint Leo Invitational. Gartrell either birdied or parred 30 out of 36 holes in the tournament which tied her for the highest percentage of such holes. Overall, she scored a 73 and 71 in her two rounds.